Certisfied to IP-65 weatherproof with 15KV ESD and 4 KV lighting protection ensures continued operation in harsh outdoor environments, endures rain, snow etc..It is a perfect solution to extend wifi signal to your garden, patio or backyard. Passive PoE simplifies the setup of the High power Outdoor WiFi Access Point. An easy-mount design and passive PoE ensure fast, flexible deployment. 2*7dBi Omni-Directional antennas provide 360°network coverage, receiving wireless range becomes wider and more stable. 1.How to find the best location? You can use your phone to find the ideal place for the repeater. If the signal received from your router is higher than 3 bars, or there are two or three wifi signal indicators that are lit, then it is ideal to place the repeater. If not, we recommend you to move it closer to your router for better WiFi signal. 2. Why the speed slow down? If encountering such problems, like slow speed or unstable signal, you could try to change the WiFi Channel to Channel 1, 6 or 11.And make sure there are at least 2 wifi indicators lit. 3. How to configure the repeater? 5. ICannot enter into admin page via http://ap.setup? Please try to clear the cache of your browser. 【Extend Your wifi Range with High Gain Antennas】--2 x high gain external 7dBi omni-directional antennas steady and increase signals strength and wireless coverage for your home garden or small business (actual performance varies in different environments).Warm Note: just installation by your phone rather than by laptop or computer. 【Improve Your Weak WIFI Signal with 2.4 and 5GHz】--Up to 600Mbps Wi-Fi speeds on 5GHz (433Mbps) or 2.4GHz (150Mbps) bands. Ultra-fast networking speed with latest 802.11ac standard. Ideal for HD video streaming or lag-free gaming. 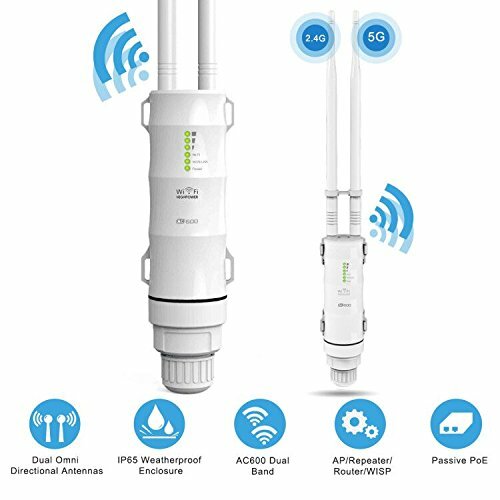 【Quality Guarantee-withstand harsh climates】--Certify to IP-65 standards, weatherproof design allows you to place the outdoor wifi extender in various location, ideal for outdoor environment.Passive Power over Ethernet(PoE) supports for flexible deployment and convenient installation. 【Multiple Operation Modes】--This outdoor WiFi repeater supports multiple operating modes as Repeater, Access Point, WISP, Router. For repeater/AP mode guide, please refer to user manual or download the guide via http://bit.ly/2zN1cOS. 【Attention and One Year Guarantee】:1. Make sure to use a certified CAT5e/CAT6 Ethernet cable with RJ45 connectors. 2. Make sure the length of the Ethernet cable is less than 60 meters (196 ft.).3.Not Compatible with Mesh Routers.One year warranty policy.Buy with confidence.If you have any concerns or questions about this product,plz email to youtopelectronics@outlook.com,we'll help you resolve your problem within 24 hours. If you have any questions about this product by U-Tote, contact us by completing and submitting the form below. If you are looking for a specif part number, please include it with your message.